First, a quick note: For our avid newsletter subscribers, you may have noticed that this newsletter is not your regular quarterly issue. You will still receive your September issue with the promised new dog treat recipes. We're really looking forward to showing you how to make Charcoal Dog Treats & our Triple Apple Dog Cake. 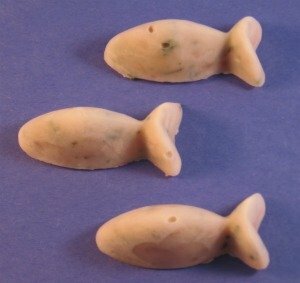 Frozen Dog Treat Recipes - When it's hot outside, you and your dog may not feel like eating warm food. Making these frozen dog treats are a quick and easy way of satisfying your dogs desire for homemade dog treats. Below is our Peanut Butter & Jelly Smoothie Pop. A tasty way to cool down. 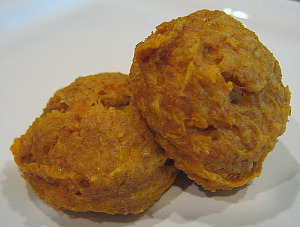 Here is our Savory Tuna Frozen Treat, just in case your dog prefers meat over sweet snacks. Now that summer is upon us, your family is no doubt very busy. When everyone in the house is off doing fun things, our dogs may miss a walk or two. No need to fret, keep your dog happy and active with dog treat toys. Pick the size and durability that best fits your dog. Next, fill with their everyday dry food, or healthy homemade dog treats. Supervise your dog to make sure she knows how to get the treats out of the toy. Then sit back and watch the fun ensue! Have you seen one of our dog treat recipes and thought, my dog would love that! Then you forgot the name of it and it was forgotten without ever being made. First we revisit a dog favorite, tripe. Although smelly, these Tripe Pom Poms make excellent dog training treats. Our second look back is our Double Sweet, Sweet Potato Cookie. With a cooked sweet potato and honey, this treat will please even your pickiest sweet toothed dogs. 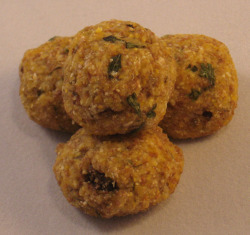 Last, but not least, this recipe can be frozen for a flavorful summer dog treat. 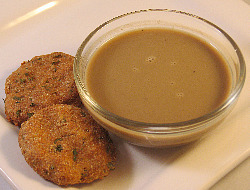 Or, you can make this Liver Gravy Dog Treat Recipe as a food topper, treat drizzle or dipping sauce. "I love your site, you are such an inspiration!" "I love your recipes and they are so easy to do. My black lab mix loves them and waits by the oven door for them to cool! Keep up the good work! What's New for the August issue?